18 Bottle Capacity: Compact, 18 bottle storage, perfect for red or white wines. 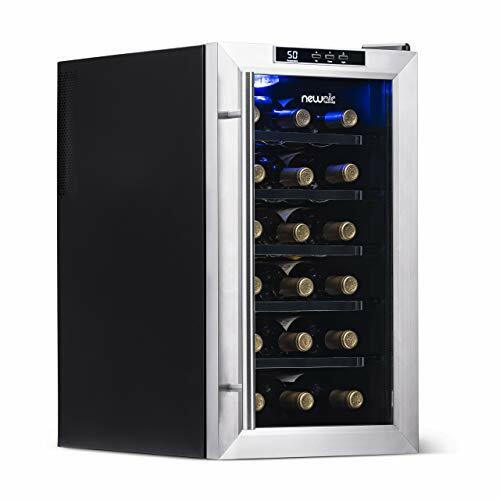 Capacity and design: The NewAir AW-181E holds 18 bottles in a thermoelectric wine cooler. It has black cabinet with stainless steel frame, chrome racks and double-paned glass door. This NewAir unit operates on thermoelectric system – environment friendly, quiet and no compressor vibration. This AW-181E should be installed as free-standing only in an open and low ambient temperature surroundings. Single temperature zone and digital temperature control: This NewAir thermoelectric unit has a single-zone cooling system; temperature range: 54°-66°F. It has a digital temperature display with push button controls – a convenient feature for you to monitor and set the correct temperature for your wine collection. Accessible shelving and LED lighting: This NewAir AW-181E features five chromes shelves that are easily slide-out. It has soft interior blue LED light that gently illuminate your wine collection. Summary: The NewAir AW-181E 18-bottle Thermoelectric Wine Cooler (View on Amazon) is a quiet and vibration-free thermoelectric wine cooler. It can accommodate 18 standard wine bottles on 5-slide out metal shelves. It has good design features such as black cabinet and with chrome racks and double paned glass door. It has functional features such as removable shelves and digital temperature controls. This NewAir thermoelectric unit has a single-zone cooling system; temperature range: 54°-66°F. This model does not have a lock. If you are looking for a compact, single-zone thermoelectric wine cooler for a collection of 18 wine bottles, the NewAir AW-181E is a good choice. If you would like to consider other top Newair models, check out our featured list of the best NewAir wine coolers.